In the latest batch of funding approvals from the Global Fund Board, three country grants and two multicountry grants were awarded $36 million. The Board also approved funding in the amount of $66 million for interventions on the Unfunded Quality Demand Register. Some of the funding for the UQD interventions came from private sector contributions. The Global Fund’s multicountry grants have been designed to address cross-border issues and bottlenecks in HIV, TB and malaria programs that single-country grants cannot resolve on their own. Multicountry grants have improved regional responses to the diseases but the grants have faced considerable implementation challenges. The OIG’s first audit of multicountry grants, based on a sample of seven and including a pioneering five-country malaria initiative, highlights systems, processes, governance and coordination issues. Two multicountry Global Fund grants in Eastern Europe and Central Asia, for TB and HIV, were approved in December 2018 by the Global Fund Board, for a total of $18 million. Implementation began on 1 January 2019, but there is lingering concern among applicants regarding the effectiveness of the competitive approach prescribed by the Global Fund for the application process. A member of one of the applicant organizations, the Eurasian Harm Reduction Association, reports on some applicants' concerns. With the world’s largest HIV epidemic, and one third of all new HIV infections in the country affecting adolescent girls and young women, South Africa faces a monumental challenge in addressing prevention for the youth population. With the biggest Global Fund investment so far in a program focused on adolescent girls and young women, South Africa will take this on, targeting not only youth but also their sexual partners, caregivers and communities. In its second audit of Global Fund grants to Madagascar, the Office of the Inspector General presented a mixed opinion on the performance of the country’s portfolio. While Madagascar has made good progress against the three diseases, the OIG said, the country still faces serious challenges within program management and supervision, and further improvements are needed in supply chain and financial systems and controls. Harm Reduction International and Frontline AIDS (formerly known as the International HIV/AIDS Alliance) released a joint briefing in January urging the Global Fund Board to sustain investments in harm reduction interventions, in advance of the Fund's upcoming decision at its May Board meeting on its allocation methodology and catalytic funding priorities for the 2020-2022 period. The Global Fund Advocates Network has developed a web page listing a number of resources for advocates relating to the Global Fund’s Sixth Replenishment. In the first-ever audit by the Office of the Inspector General (OIG) of the Global Fund’s multicountry grants, the OIG has praised their strategic repositioning for greater impact as well as some improvements in regional coordination on specific issues. However, the OIG says, the multicountry grants’ implementation arrangements need to be improved, and the Secretariat’s resource allocation, processes and systems need to be better tailored for the different demands and management needs of cross-country programs. The audit also found that one specific, pioneering program to combat malaria in the Greater Mekong region – focused especially on resistance to antimalarial drugs – continues to face challenges. The audit report was published on 14 February 2019. The Global Fund created multicountry grants in order to strengthen programs’ attempts to tackle regional bottlenecks and cross-border issues – “diseases don’t respect borders,” as the Fund’s website says. Through multicountry funding, the Global Fund is addressing three “key multicountry priorities” considered critical in fulfilling the Fund’s Strategy 2017-2022, and which cannot be addressed through country allocations along. These priorities, approved by the Board as part of the broader $800-million catalytic funding envelope, are: Malaria elimination in low-burden countries ($145m); finding the missed people with TB ($65m), and sustainability of HIV services for key populations ($50m). The objective of the OIG audit was to assess the design and effectiveness of multicountry processes and policies in achieving grant objectives – which can differ in their nature to those for national grants. The audit also considered future design arrangements for the implementation of multicountry grants. The audit reviewed a sample of seven multicountry grants out of the 34 that were active over the review period. These seven grants had a combined investment of $205.9 million, out of a total of $358 million, and included the Regional Artemisinin Initiative (RAI). The audit reviewed a two-year period, from January 2016 to December 2017. The amounts given in the ‘Budget’ column of the grants table on page 10 of OIG report reflect amounts allocated up to the point at which the OIG reviewed those grants; in most cases these differ from the signed grant amounts, therefore comparisons with grant information on the Global Fund website will yield discrepancies. $100m was the allocation amount for 2014-2016; additional allocation for a 1-year extension was $16m. The signed amount for this grant across allocation periods 2014-2016, 2017, 2018-2020 is $347m. $8m is the full allocation; $7.38m is the signed amount. $5.6m is the full allocation; $4.59m is the signed amount. $11.7m is the full allocation; $9.5m is the signed amount. The grant currently listed on the Global Fund website is an extension to the grant considered by the OIG. $16.8m is the full allocation; $14.2 is the signed amount. $17.8m was the allocation for 2014-2016; a continuation of the grant was signed at the start of 2018. $30m was the allocation for 2014-2016; $14.2m was allocated for the next allocation period. ‘TIMS’ refers to ‘Tuberculosis in Mines’. Multicountry grants have facilitated regionally coordinated responses and integrated approaches to addressing regional issues; the examples given include malaria elimination, tuberculosis in mining communities, and access to services for refugees, migrants, and other mobile populations. Multicountry grants have been helpful in strengthening governments’ and partners’ commitments to addressing cross-border issues, for example mobilizing additional funds from the private sector and partners to support the regional grants. Multicountry grants have facilitated the creation of multilateral platforms to oversee grant implementation. This inclusion of governments, partners, civil society and people living with the diseases has enhanced intercountry collaboration and information sharing. A competitive grant application process for multicountry grants (via Requests for Proposals published on the Global Fund website four to six months before the submission window) has generated new ideas and innovations (this observed by the Technical Review Panel, the OIG said). 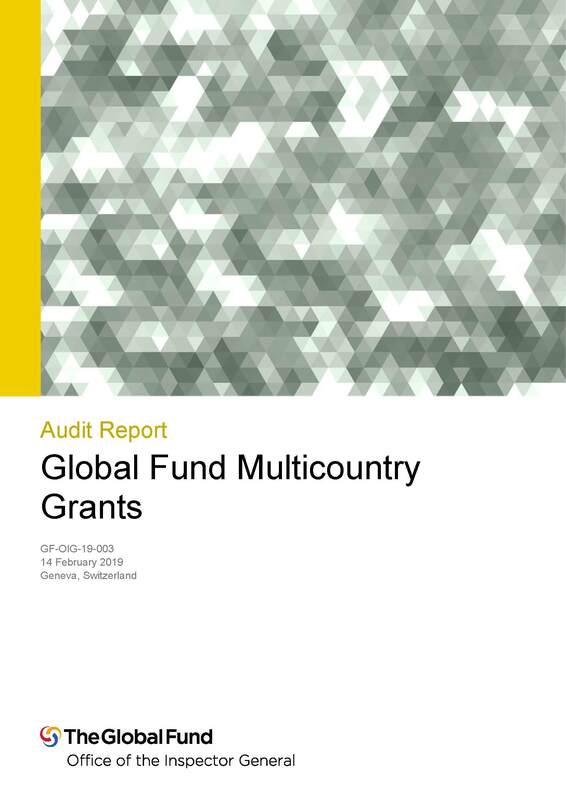 During the 2016-2017 period reviewed by the OIG, 55 countries had three or more active multicountry grants in addition to their national Global Fund grants, and 11 of these had six or more active multicountry grants. This multiplicity of grants has produced challenges in coordination, oversight and governance at both Secretariat- and country level, for reasons including the lack of a single focal point for multicountry grants at the Secretariat, with grant management defaulting often to country teams managing national grants. The OIG also said that there are no guidelines for Secretariat-level coordination, either between different multicountry grants or between multicountry and national grants. This has resulted in duplication – in some cases – of activities for the same target groups and areas, for example in both a Southern Africa regional grant and Mozambique country grant. The multicountry priorities for the 2017-2019 allocation period approved by the Board are expected to help streamline multicountry grants to mitigate this duplication risk. This long section (4.2, on page 12 of the OIG’s report) goes into detail about the complexities and specificities of multicountry grants that have not yet been accommodated by Global Fund processes and systems, naming four sub-sections within this overarching set of issues. These are (i) that complexities of multicountry grants, which are greater than those of national grants, are not considered in providing resources for risk and assurance; (ii) that there are limited human resources dedicated to multicountry grants; (iii) that risk identification and its associated tools are not adequately tailored for multicountry grants; and, discussed most extensively in this section by the OIG, (iv) that there are limited requirements and guidance for governance arrangements for multicountry grants. On this fourth issue, the OIG explains the lack of specific governance requirements for regional organizations: Regional Coordinating Mechanisms must adhere to Country Coordinating Mechanism (CCM) guidelines, but are only required to comply with two out of the six requirements – regarding Principal Recipient selection and the funding application process. There are no requirements imposed by the Fund on Regional Organizations to have in place a governance structure with oversight arrangements and a policy to prevent conflicts of interest; given that up to half of all multicountry grants operate under a Regional Organization (not Regional Coordinating Mechanism) model, this is especially concerning. As a result, the OIG says, not all multicountry grants have adequate governance mechanisms to ensure effective grant implementation and coordination with the especially diverse group of stakeholders in these grants, and important processes are managed in an ad-hoc manner. In addition, oversight structures – to the extent that they are in place – lack maturity, the report says. The Regional Artemisinin-resistance Initiative (RAI) was created by the Global Fund in 2013 to tackle increasing artemisinin (and more recently, multi-drug-) resistance, which at that time was a threat particularly in the Greater Mekong sub-region, and since then has become a global threat. The RAI was implemented from 2013 to 2017 alongside the respective malaria programs of Cambodia, Lao People’s Democratic Republic, Myanmar, Thailand and Viet Nam. The grant has had major impact, according to the OIG, in both a sharp decline in malaria incidence (more than 50%) and mortality (99%) between 2012 and 2017, and in numerous processes including the creation of a regional elimination strategy, systemic interactions between malaria programs, and the strengthening of national leaders’ political commitment to regional elimination. However, the OIG said, the program still faces challenges in treating, investigating and classifying malaria cases, and from the continued availability of artemisinin monotherapies (which contribute to resistance and which were prohibited in 2012). The spread of resistance to many antimalarial drugs is an increasing problem, threatening the significant gains made worldwide in combatting malaria. Objective 1: Design and effectiveness of Secretariat processes, procedures and systems to ensure effective program implementation and performance to achieve grant objectives, as ‘partially effective’. Objective 2: Design and effectiveness of governance, coordination and assurance arrangements to ensure multicountry grant funds are used as intended, as ‘partially effective’. During the 2014-2016 allocation period, there were 34 ‘regional’ grants (as they were called then), of which 26 were for HIV, four for TB and four for malaria. The Global Fund’s allocation methodology changed for the 2017-2019 period, whereby it allocates up to $800 million for ‘catalytic investments’, of which three ‘multicountry strategic priorities’ have available funding envelopes totaling $260 million. These strategic priorities are malaria elimination in low-burden countries, finding missing cases of TB, and sustainability of services for key populations, the ‘available envelopes’ for which are $145 million, $65 million and $50 million, respectively. The “deep dive” performed by the OIG on the RAI looks at a grant that covers five Southeast Asian countries (Cambodia, Thailand, Myanmar, Laos and Viet Nam), to support them in expanding their efforts against malaria and eliminating the most deadly strain of malaria. RAI was launched in 2013 in response to the emergence of drug-resistant malaria in the Greater Mekong region. The other six grants (see Table 1) include grants across regions where the GF operates. For the 2017-2019 allocation period, the Grant Approvals Committee has approved 14 multicountry priorities. AMA 1: The Secretariat will conduct an evaluation of a pilot governance approach currently underway in the Latin American and Caribbean region to address challenges in the oversight of multicountry grants. This AMA is due by 31 July 2019. AMA 2: The Secretariat will review guidance and policies for multicountry grants, to identify changes that need to be made “based on materiality, risk, and efficiency considerations”; such changes will be implemented during the next funding cycle. This AMA is due by 31 December 2019. AMA 3: The Secretariat will work with the Principal Recipient as well as the National Malaria Control Programs and partners to build the surveillance capacities of national malaria programs. This AMA is de by 31 December 2019. The AMAs are ‘owned’ by the Head of Grant Management Division, and in the case of AMA 2, also by the Head of Strategy Investment and Impact Division. Article in this GFO on challenges experienced by applicants in Eastern Europe and Central Asia during the new, competitive application process for multicountry grants.